Can you imagine Chuck Norris and Bibi Netanyahu getting together? What an awesome event! Well, it just happened. Chuck Norris was in Israel with his wife and security detail. They were there unannounced and wound up meeting the Prime Minister of Israel. Bibi joked that “Israel is strong, but it’s indestructible now!” Heh. With the election only days away, Israel has an important decision to make, so let me tell you what Chuck would do. You might think I’m a tough guy in my films, but in a rough neighborhood like the Middle East, Israel has its own tough guy. His name is Bibi Netanyahu. Bibi brought the pressing issue of Israel’s security to the world, speaking loudly and clearly at the United Nations and in Congress, bringing the world together to put sanctions on Iran. So vote for Benjamin Netanyahu, because a strong prime minister is a strong Israel. I’m Chuck Norris and I endorse this message and Benjamin Netanyahu, your strong prime minister. Israeli Prime Minister Benjamin Netanyahu, for whom the security of his nation is no laughing matter, made a brief exception on Wednesday. 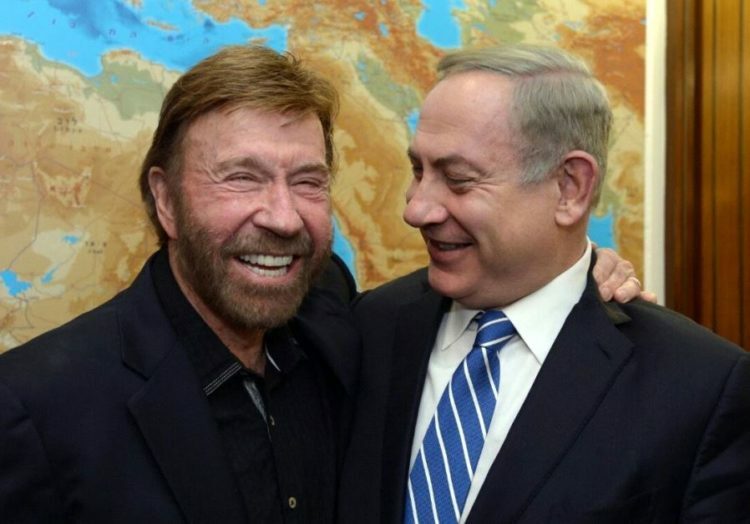 “Israel is strong, but it’s indestructible now!” a grinning Netanyahu said as he met with actor Chuck Norris, who was visiting Israel. Netanyahu joked that with Norris on hand, all the security teams in the building could stand down. “Believe me, you’ll always have my support,” Norris told Netanyahu. Norris had spent several days in Israel with his wife, Gena O’Kelley. There was no public announcement of his visit. “It was an honor to spend time with Israeli Prime Minister Benjamin (Bibi) Netanyahu. God bless, Chuck Norris,” he wrote. Netanyahu won in 2013 and 2015. Today, he is forming a strong bond with President Trump and once again, we are the strongest of allies. It’s a major relief to me that we are protecting and supporting Israel once again. We have yet to settle if our embassy will move to Jerusalem where it should be and there are still issues over Israeli settlements, which I believe is Israel’s business and no one else’s. But now we have a working relationship and our friendship is once again intact. I have hope that the rest will be worked out the right way. The Walker, Texas Ranger actor has boasted of the three movies he has filmed in Israel, including the 1986-action thriller Delta Force, directed by Israeli filmmaker Menachem Golan. This is a great time for Norris to visit with Bibi, who has political problems of his own, which I’m sure will settle in his favor. These are not just famous men, they are both warriors and it is great to see them meet this way.